Woke up to a drizzly morning that quickly changed to sunny as we partook of breakfast with our newfound friends. To fulfill obligations in the itinerary, we were later taken across an inland lagoon in a very short trip that left much to be desired. Dropping off at the handspan office in Hanoi post-lunch, it was a bit sad to see off our new friends. Train tickets in tow, we had a few hours to spare so we walked around Hanoi, ate the famous century-old grilled fish and noodles dish at the famous Cha Ca La Vong Restaurant for dinner and a post-dinner meal at Huo Guom Café near Hoan Kiem Lake. Then, it’s off to the train station onboard an overcharging taxi (tip: avoid the blue and green taxis) with a meter that seemed to work like a one-arm bandit, clicking after every few meters. The station was a bedlam but we quickly found our train. It's going to be night of bumpy sleep from 9pm to 5am. Nevertheless, the softsleeper was cool and a bit comfortable. Tired and sleepy, I quickly met the sandman, knowing we have a full day ahead tomorrow. sa train pala yan? ganda naman ng kwarto. thanks for the tip on the taxis kasi balak ko din talaga pumunta ng vietnam. hihingi pa ako sa yo ng ibang tips. pag pupunta na lang ako. by the way, i need your top three favorite island experience bro. if you have time, please check out the "your island experience" post. kasi dami mo ng napuntahang islands. dom, it's actually a compartment for four people, may second deck but it's quite comfortable and if you're not easily motion-sick, the train's chugging motion can actually lull you to sleep. sige, will visit your site now. i smiled as i read your post and remembered a similar overnight train trip my hubby and i went on. i slept like a baby but he was on the top bunk and complained of tossing and turning the whole night. 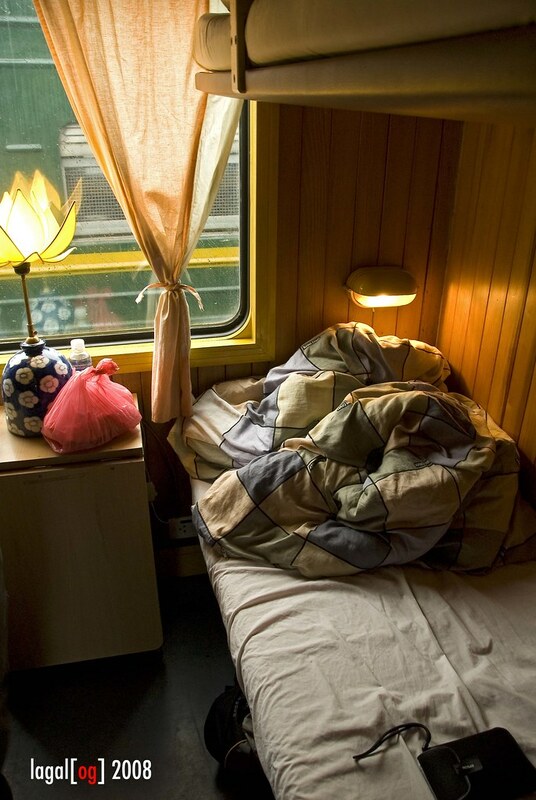 do we have sleepers in manila too?